One of the most common questions we receive is whether or not we move trees. Yes, we do! We actually specialize in large tree moving, anything up to 30′ tall. People call in each week asking us various questions about moving trees. 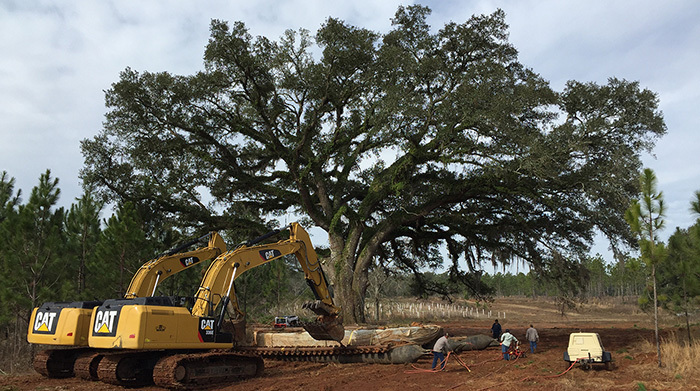 We are able to move trees up to 30′ tall and about 8″ in trunk diameter. Sometimes called the caliper or diameter, we measure the trunk about a foot off of the ground. We do this to ensure that we bring the proper size of spade. Our most common spade is a 54″, but we have all the way up to a 90″ spade. For most jobs the 54″ is sufficient and can be operated with our Takeuchi machine. We bring it in on a trailer hauled by a normal truck and the job usually goes fairly quickly. If you do have a massive tree then we’ll need to bring in our 90″ spade which is hauled by a semi. Another common question we receive is if we can even move trees. We absolutely can move trees! 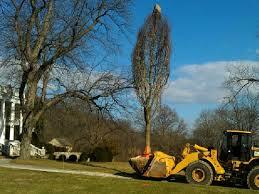 We commonly move trees from one place on your property to another place. Another option is that we can bring a tree from another location to your property, or vice versa. Some people prefer this option simply because they don’t have the type, or size, of tree they want already on their property. It’s also in our repertoire to move a large amount of trees for commercial use. We recently completed a moving job for a new TV show. We also have contracts to move anywhere from 40-200 trees over the course of a few days. These jobs do take a bit longer to do, but it’s truly incredible to see how a property can be changed with the addition (or removal) of trees. Whether you want us to move trees around on your property or off it completely, we’re here for you! Give us a call at (385) 257-0055 or drop by and we’ll be glad to help you!